RST on the OLED PCB must not be connected to the xmos PCB on some version of firmware. It may not light up properly. 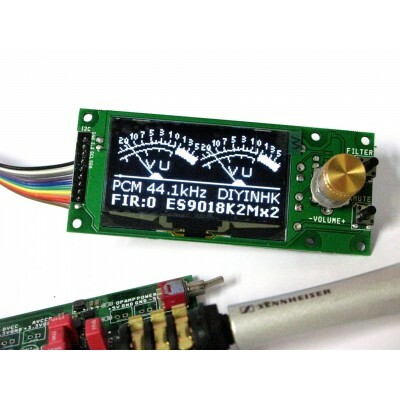 This 2.42" OLED and rotary encoder volume control PCB is designed to work with our XMOS PCB flashed with the latest version of firmware. The button to change FIR filter is active when used with AK4497/AK4495/AK4490, ES9038PRO/ES9028PRO, ES9018K2M specific firmware. The filter can be changed instantaneously without restart the DAC. (the common problem of analog volume control is imbalance of left and right channel after few months of use, click noise when change volume(due to dust get inside), variable resistor in the signal path can also degrade the sound quality seriously. *Bit perfect* means the audio data is bit perfect transfer to the DAC chip, and the volume control is done in the DAC chip. 2. The OLED brightness is controlled by a variable resistor in the bottom side, user can use a screw driver to change the OLED brightness easily. 1. User can use the DFU utiltiy in the windows driver installed directory to flash the xmos pcb with the latest firmware. Please notes different version of driver is installed in different directory. 2. Depends on the brightness set by the variable resistor, the OLED pcb current usage is 10mA to 50mA. (If the system is not stable after the oled panel is connected or the brightness is set to maximum, user can supply 3.3v to the oled panel directly or clean the 20pin cable and other contact by alcohol. 3. If the windows/linux/mac playback software is not in focus, the button may not work. 5. Please ask us for firmware update image after you have purchase this PCB if you bought our XU216 XMOS PCB before 2017-3. *For the orange color panel, although the image look like yellow but it look like orange color in real world. This 2.42 OLED panel can be directly connected to our XMOS PCB with onboard 1V0 DC-DC convertor. i.e. the new xcore200 384k xmos pcb and isolated 768k xmos pcb. It can also be used with the new 768k(1W) noisolated XMOS PCB. For the original 768k noisolated xmos PCB and multichannel xmos pcb, as they are using 1v0 linear regulator, please supply the OLED PCB with external power as the following notes. Remove J2 and use dedicated 3.3V to supply the display power. Short the choke on the 0.8uV regulator PCB as the item image to avoid choke overheat. Supply all the OLED digital and display power externally. i.e. connect only 3pin GND SCL SDA to the I2C header on the XMOS PCB. As J2 is used to connect between the digital and display 3.3V, user can supply one dedicated 3.3V only to VCC and it can power both digital and display section. For this arrangement, as the OLED PCB is needed to initialize by i2c command from the xmos pcb during startup. Therefore, the oled digital 3.3V must start before or in the same time as of the XMOS PCB. 2. The mounting hole center is 3mm from the pcb edge with 3mm hole diameter.